‘I really don’t think we’re supposed to be here,’ Yvette said. Sarah sighed. When had her best friend become so obsessed with rules? Didn’t she know how to have fun? Sarah and her friend, Yvette live in a coastal town. Water-loving Sarah lives on a houseboat with her mother. Yvette lives in town. Yvette is a mostly-willing companion/accomplice in Sarah’s sometimes wild schemes. Sarah loves ghosts and is determined to prove their existence. Where better to find one than deep inside a cave system? They have only just begun their search when a ocean monster on the beach pulls them and almost everyone in town to the water’s edge. It’s an impossible thing, and Sarah wonders where it came from? Later, she finds far more than she expects as she starts to explore an old sunken ship. Her discoveries leave her with many, many more questions. 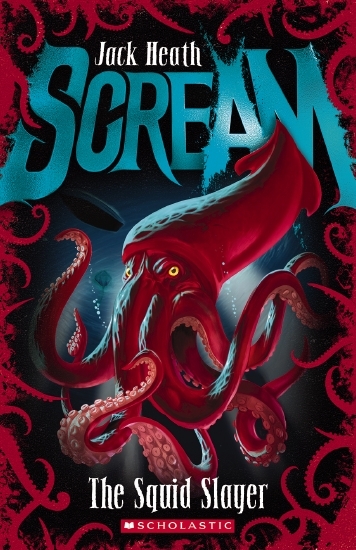 The cover features an evil-looking squid and the tentacles of many more. The back cover warns ‘read at your own risk’. Pages are surrounded by dark borders adding to the claustrophobia. The Squid Slayer is mystery, fantasy and horror combined, pitched at newly-independent readers, one of four titles in the new Scream series from Scholastic. Sarah is an outsider, at least partly because of her reputation for tall tales and her belief in ghosts. Yvette is a mostly-willing assistant, trying to keep her friend safe. The Squid Slayer is not for the faint-hearted. Hold on to your wetsuit, and ready your fins for an ocean-based thriller. Recommended for independent readers who like a frisson of danger in their fiction.